The 205 million-year-old jaw bone of a prehistoric reptile belongs to 'one of the largest animals ever' say a group of international palaeontologists. The new discovery has also solved a 150 year old mystery of supposed 'dinosaur bones' from the UK. The bone belongs to a giant ichthyosaur, a type of prehistoric aquatic reptile, and experts estimate the length of this specimen's body would have been up to 26 metres. Approaching the size of a blue whale. Paul said "Initially, the bone just looked like a piece of rock but, after recognising a groove and bone structure, I thought it might be part of a jaw from an ichthyosaur and immediately contacted ichthyosaur experts Dean Lomax (University of Manchester) and Prof. Judy Massare (SUNY College at Brockport, NY, USA) who expressed interest in studying the specimen. I also contacted Dr Ramues Gallois, a geologist who visited the site and determined the age of the specimen stratigraphically. "As the specimen is represented only by a large piece of jaw, it is difficult to provide a size estimate, but by using a simple scaling factor and comparing the same bone in S. sikanniensis, the Lilstock specimen is about 25% larger. 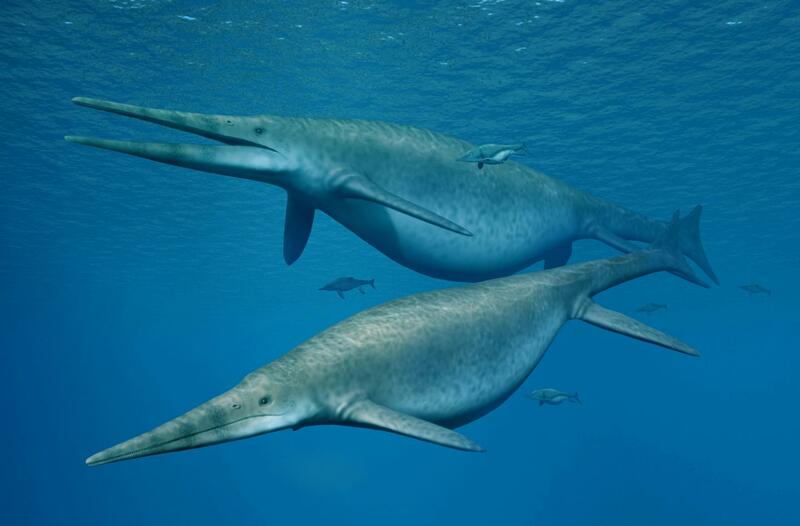 Other comparisons suggest the Lilstock ichthyosaur was at least 20-25 m. Of course, such estimates are not entirely realistic because of differences between species. Nonetheless, simple scaling is commonly used to estimate size, especially when comparative material is scarce." Added Lomax. Dean added: "One of the Aust bones might also be an ichthyosaur surangular. If it is, by comparison with the Lilstock specimen, it might represent a much larger animal. To verify these findings, we need a complete giant Triassic ichthyosaur from the UK – a lot easier said than done!" The new study is open access and has been published today in the scientific journal, PLOS ONE. A visiting scientist at The University of Manchester, Dean is passionate about communicating palaeontology with the public and regularly appears on television, including as series advisor and recurring on-screen expert presenter for ITV's Dinosaur Britain. He has written two books, numerous scientific papers, and many popular articles. Dean is also the patron of the UK Association of Fossil Hunters (UKAFH). More here: http://www.deanrlomax.co.uk. Please reference the article as: Lomax, D. R., De la Salle, P., Massare, J. A. and Gallois, R. 2018. A giant Late Triassic ichthyosaur from the UK and a reinterpretation of the Aust Cliff 'dinosaurian' bones. PLOS ONE, http://journals.plos.org/plosone/article?id=10.1371/journal.pone.0194742.